Colin meets the New England Patriots! 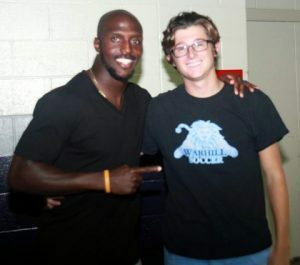 Colin is an 18-year-old whose dream was to attend a game at Gillette Stadium and meet the New England Patriots. That dream became a reality on a beautiful Sunday in Foxborough, MA. 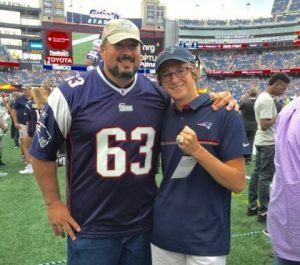 Colin and his family arrived at the Stadium and were greeted by one of the Patriots staff who had coordinated many surprises for Colin. First was a special meet and greet in the Patriots locker room as the players were coming off of the practice field. One of the treasured surprises was a signed jersey from Tom Brady, Colin’s absolute favorite player. 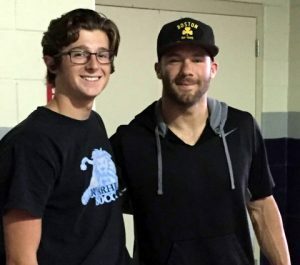 Colin met many of the players and he especially enjoyed meeting his favorites: Jimmy Garappolo, Julian Edelman and Chris long. The team was very welcoming and warm. Colin took many pictures with the team and had the chance to chat with the players. After enjoying their amazing time with the players, Colin and his family toured the Hall of Fame Museum, which is a showcase of history of the New England patriots as well as the current team. Next day was game day! Colin and his family arrived early to watch the team warm up before the game. Another surprise for Colin was former Patriots player Joe Andruzzi who was also a Lymphoma survivor and was very excited to share with Colin his story about his illness and road to recovery. The Patriots enjoyed a well-deserved win over the Dolphins…the icing on the cake for Colin’s wonderful experience. We are happy to report that Colin is a healthy young man and is attending college in the next chapter of his life.